I'm very happy to learn that a friend's newly released book is earning some nice recognition. 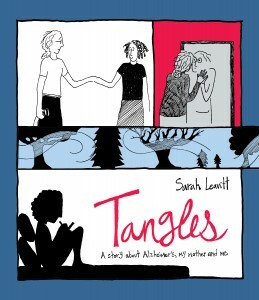 Sarah Leavitt is a Vancouver cartoonist whose book Tangles: A Story About Alzheimer's, My Mother and Me, was just named a finalist for the prestigious Writers' Trust of Canada Non-Fiction Prize--the first graphic novel finalist in the award's history. Sarah gets $2500 for making the short list and, if she wins (to be announced Nov. 2), would receive $25,000. Sarah and I began corresponding because I guess she thought the Mom's Cancer guy might have some idea what to do with a comic about losing her mother to Alzheimer's disease. I liked her work a lot, offered some advice when asked, and, after she found a publisher, was glad to provide a blurb for her book's back cover (my first!). Now she's doing readings and signings, conducting interviews, and living the literary life. If this Writers' Trust recognition is any indication, Sarah may be yet another writer I've advised at the start who goes on to rocket past me. I love it when that happens. Just sent a link to a young relative dealing with this. And here I thought you were only useful for my friends who were facing cancer. God, the glamourous life of a published author. I was asked; I blurbed. Not expecting to make a habit of it. Really: I do not intend for this to be humorous in the slightest, but if I were going to write a graphic novel about my experiences dealing with family members having Alzheimer's I would call the book "Drawing a Blank." But "Tangles" is a great name too. I hope it's at my local B&N because I'm going to look for it. And then Captain Girlfriend will swipe it from me and tell me I have to finish my thesis and I'll reluctantly agree and make "Grrr" noises. Um, rocketing past you? Doubt it. I am eternally grateful for summoning up the courage to write you, Brian!